Building a Pro Touring car takes a great deal of imagination. In most cases, you’re not looking at a blank canvas but rather a car that may be months, weeks, or evens days from the crusher. 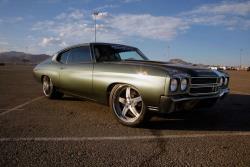 Take the case of our feature car, Chris Wissing’s 1970 Chevelle. Chris has owned the car for over 25 years, and says, “it was my daily driver, bracket racer, and about anything in between.” The Chevelle looked sad and tired; with faded paint, a vinyl roof, and at least one fender replaced by one from another car. Chris’s dream had been to rebuild an A-body to his exact specifications, and this Chevelle was his starting point. After a few stalled efforts, a full-time job and a new baby, his wife Rebecca stepped in. No, she didn’t tell him to get that pile of ferrous oxide off her property, but rather told Chris he should send the build out to the shop of his choice and have the car built to his specs – and within his lifetime. Having grown-up in Eugene, Oregon, Chris decided to use the resources with which he was most familiar. The shop Chris selected was Eron Anderson’s Precision Classic and Collision in Eugene, Oregon. They began where all restorations start: taking the entire car apart and determining which parts were still serviceable and which needed to be recycled. The frame didn’t pass the test, but that was just as well, as Precision installed a modern, bulletproof fully-boxed 10 gauge steel frame with IFS from the Roadster Shop. Step 1 of 5894. The suspension consists of a fabricated Strange Engineering Ford 9-inch rear (3.90:1 R&P) attached via a parallel four-bar setup with Panhard rod and Afco coilovers for both springing and damping. In the front is a C6-based IFS with billet spindles and hubs, tubular control arms, and a 1.25-inch splined anti-roll bar, also employing Afco coilovers. Between those front frame rails reside the desirable Chevrolet Performance LS376 V8. Based on the LS3 that served in both the Corvette and the Camaro SS, the Chevy Performance folks thought it would be an awesome idea to install their ASA full-race camshaft into the LS3. Some tasty tidbits include an aluminum block and heads, L92 rectangular port type heads, 10.7:1 compression ratio, a hydraulic cam that may set some sort of pole vault record with 0.525 lift on the 2.165-inch intake valves and 0.525-inch lift on the 1.590-inch exhaust valves. Fuel is fed from a Rock Valley gas tank with internal pump. 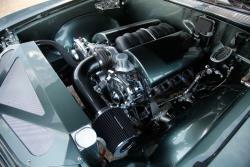 Rated straight out of the box (crate) the LS376 delivers 525 horsepower. Almost as important as the inflow of air and fuel is the movement of spent gases out of the combustion chamber and away from the car. For that task Chris selected a set of headers developed specifically for LS engine installations in GM A-Bodies by Ultimate Headers. From there, spent gases move rearward through a custom three-inch stainless steel exhaust system to a pair of Flowmaster mufflers. Rather than the GM-based performance automatic transmission you see bolted-up to any LS conversions, Chris went old school with a clutch operated by the left foot and a Tremec T-56 operated by the right hand. 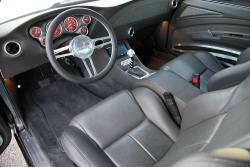 The six-speed T-56 is more than up to the task of handling the LS376 as it was originally designed for the Dodge Viper and installed in both the Corvette and the Camaro, however it is a little larger than GM engineers had in mind back in the day. To compensate for the larger transmission, a new tunnel was fabricated between the front seats. Under the hood the real detailing begins. A custom intake feeds the throttle body from a chrome-topped Spectre conical filter that features an inverted cone for improved service life and enhanced flow potential. The entire engine bay has been smoothed out, with custom radiator baffle and injector covers. The Health Department would grade the engine bay an A -- it’s that clean. Before any paint was applied to the exterior, Precision Classic and Collision had a little body work to deal with. As mentioned, Eron and Chad Westrick cleaned-up the engine compartment, smoothed the firewall, and centered the radiator. On the exterior, they installed a pinched in El Camino front bumper (extra points if you spotted the difference in Chevelle and El Camino front turn signals). All bolts, jack slots, and license plate hardware were removed and fender extensions were lengthened to fit tight to bumper. The same was done to the rear. Fender and hood trim was either deleted or smoothed. And overall, gaps tightened and lines sharpened. Fesler Built provided the headlights, taillights, and steering wheel. At the rear, the body received the mini-tub treatment to fit Michelin Pilot Sport 345/30R20 on 20x13-inch Boze Tach alloys. 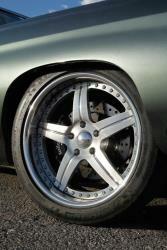 Fronts, by the way, are 19x9-inch Boze Tachs with 275/30R19 Michelins. Stopping the beast are 13-inch rotors with Wilwood six-piston calipers all the way around. The car was sprayed by Precision in a custom blend of PPG paint. On the inside Chris spec’d and Precision created a very livable environment. Using front buckets and rear seats from a 2004 Pontiac GTO was both a clever solution and also creates a connection with another former A Body model. The dash, console, and door panels were all custom-built by Custom Built by Clint Jack at The Shop LLC of Pompano Beach, Florida. 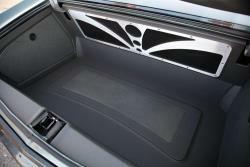 The recovering of the seats in grey leather, along with matching headliner in grey suede with aluminum inserts and carpet are all the work of Jon Lind Upholstery in Eugene, Oregon. Vintage Air blows the cold air while a custom audio system by Dean Higgenson of Custom Audio of Eugene blows the cool tunes. Starting with a Pioneer head unit, Dean then created a custom enclosure for a Kicker subwoofer and powered it with its own dedicated Phoenix Gold amp. Mid- and high-level frequencies are handled by a Morel Tempo component speaker system. So now after two years and a sizeable investment, Chris is enjoying his Chevelle in several ways. He’s won awards at car shows, he’s competed against other Pro Touring cars in autocross events, and takes his family out for a ride on sunny Sundays. And isn’t that what owning a Pro Touring car is all about?